To find all six test reports easily in the Aardenburg test results database, filter the database for [batch] = “N”. They have ID#s 311-316. The test samples were subjected to 200 Megalux hours total light exposure dose which is equivalent to approximately 100 years on display at the often-cited Wilhelm Imaging Research, Inc. extrapolated “display life” condition of 450 lux average illumination for 12 hours per day. Aardenburg Conservation Display Ratings assess the “period of excellence” in print quality where the viewer will be unlikely to observe any noticeable fading even though it can be measured with precise spectrophotometric instrumentation. That said, there’s more to the print longevity story. What happens when the print is exposed to greater amounts of light exposure, and the viewer does indeed finally begin to see noticeable fading and/or discoloration? Is the print aging gracefully or with objectionable color shifts? Is the media yellowing? Are there specific weak colors and/or tones that exhibit greater amounts of fade? To understand how the chosen printer/ink/media combinations will eventually fade by light exposure on display, one needs to consider the nature and rate of change in color and tone reproduction which occurs as the Aardenburg Conservation Display Rating exposure limits are exceeded by increasing amounts of light exposure. 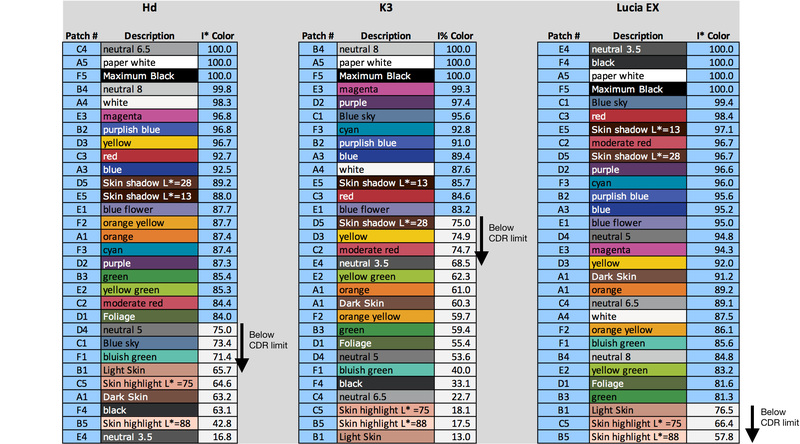 By studying the reproduction quality of the 24 patch Macbeth Color Checker Chart along with the six additional color patches included in the Aardenburg 30 patch color target, we can infer how increasingly more noticeable color and tone errors will translate into full pictorial images. The faded targets are digitally reproduced from their measured colorimetric data and thus accurately represent the visually observable fading signature of each printer/ink/media process as it progresses to increasingly higher exposure levels during the total test cycle. Although Aardenburg Imaging & Archives staff go to great lengths to ensure very tight calibration between different light fade test units and the data loggers that track the light exposure, temperature, and humidity over the course of our testing, this potential source of variation was eliminated in this study by running all six printer/ink/media combinations side-by-side on the same light fade test unit. The two media used in this study were also deliberately chosen to be free of optical brighteners (OBAs) so that media yellowing due to OBA burnout would not be a confounding factor in the outcome. 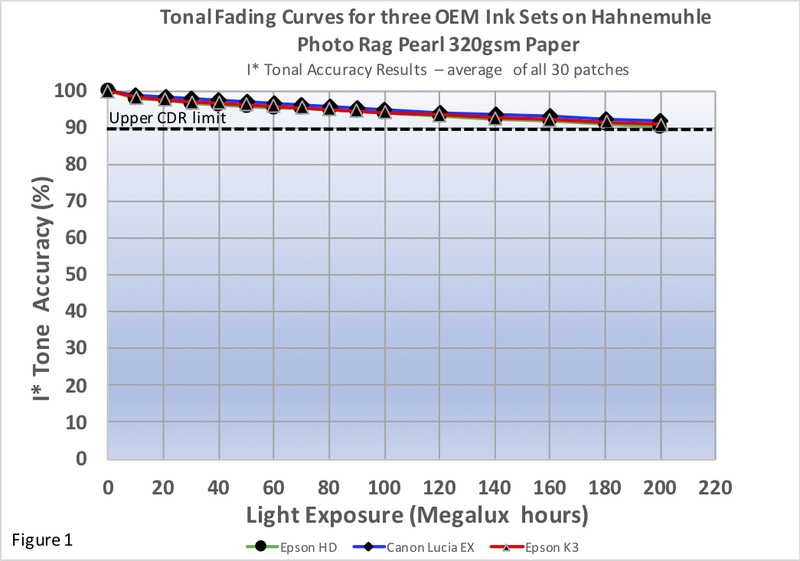 Figures 1 and 2 plot the I* tone curves for all three ink sets on Hahnemühle Photo Rag Pearl media. Results were very similar for the Epson Watercolor Paper Textured media. All three ink sets maintained high overall tonal accuracy on both media such that the Conservation Display rating limits were all reached by color (i.e., hue and chroma) changes rather than changes in image lightness and contrast. Even the worst three patches (10% of the total patch count) maintained above 80% tonal accuracy over the full test cycle with respect to the lightness and contrast relationships between each patch and its surrounding near-neighbor patches. The I* tone scores therefore indicate the viewer will not observe much loss in image density or contrast, rather he or she will first notice select hue and chroma shifts as these systems begin to exceed their Conservation Display Rating (CDR) limits. These I* tone results can also be verified by visual examination of the test targets reproduced on pages 9 and 10 in the pdf version of this article. 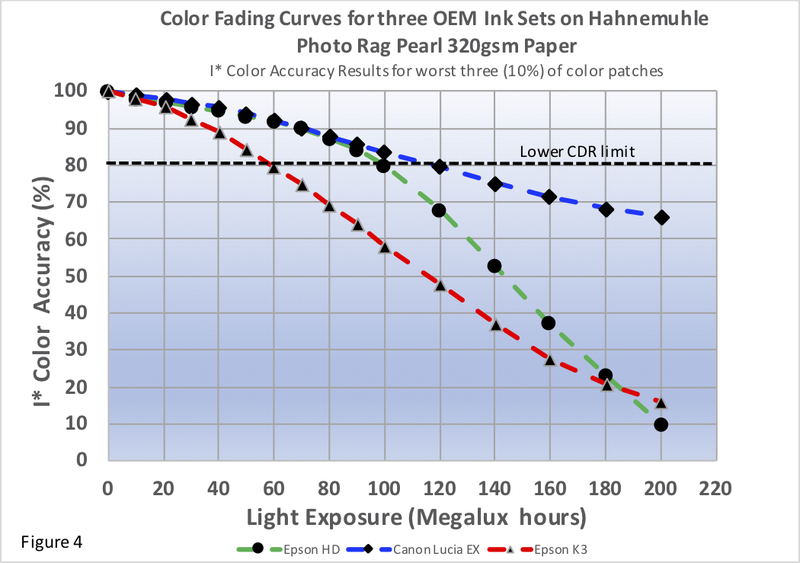 Figures 3 and 4 plot the I* Color curves for all three ink sets on Hahnemühle Photo Rag Pearl media. Figures 5 and 6 plot the I* Color curves for all three ink sets on the Epson Watercolor Paper Textured media. 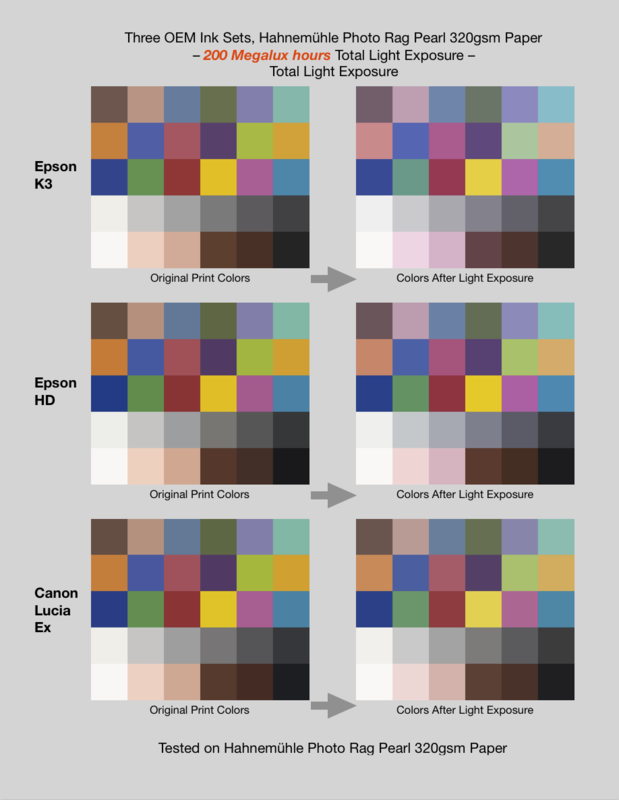 In rank order, the I* color curves show that the Canon Lucia EX ink set is the most fade resistant overall, the Epson HD set is initially comparable but only up to approximately 100 Megalux hours. It then drops steadily into second place. The Epson K3 ink set is in third place on both media. It has significantly poorer fade resistance during the first 100 Megalux hours of light exposure and consequently much lower CDR scores on both media. 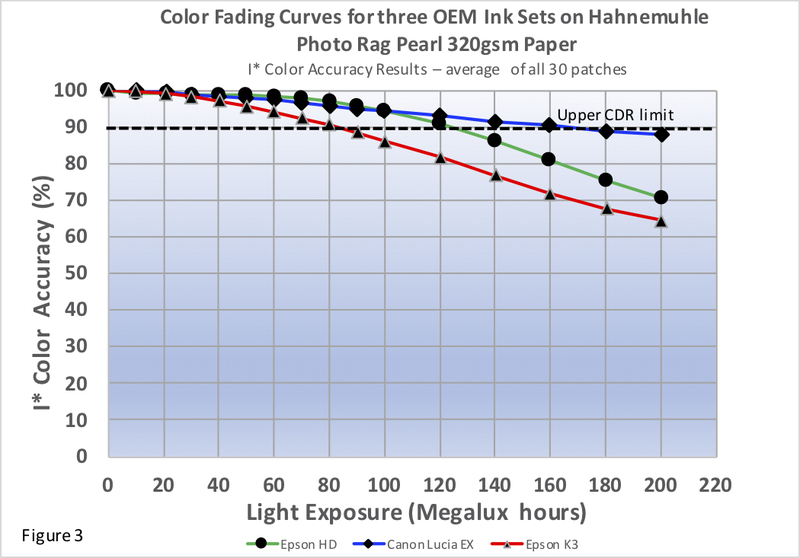 The I* color curves in figures 3-6 clearly show that up to approximately 100 Megalux hours of light exposure the Canon Lucia EX and the Epson HD are comparable in fade resistance. One could arguably call it a tie had the testing stopped at 100 Megalux hours. 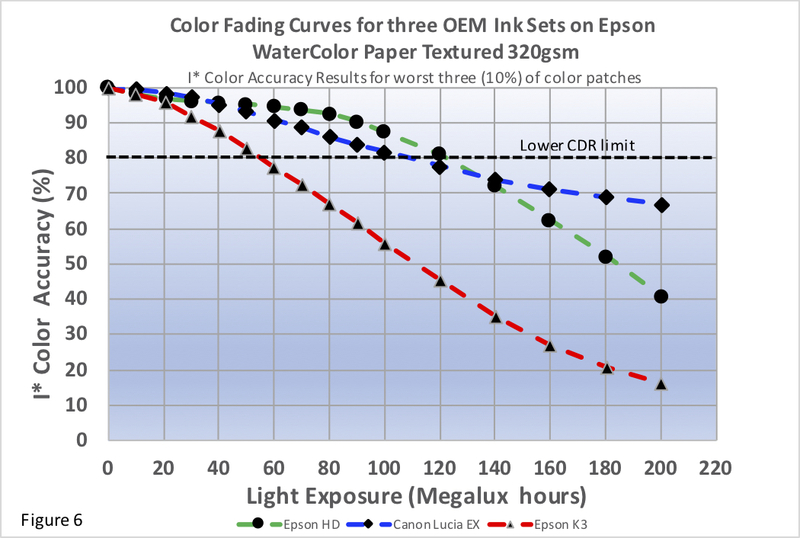 However, starting at 90-100 Megalux hours, the Epson HD ink begins to show a strongly bifurcated curve response, and the fading rate becomes much greater than the Canon Lucia EX ink set which continues on its perceptually linear path. 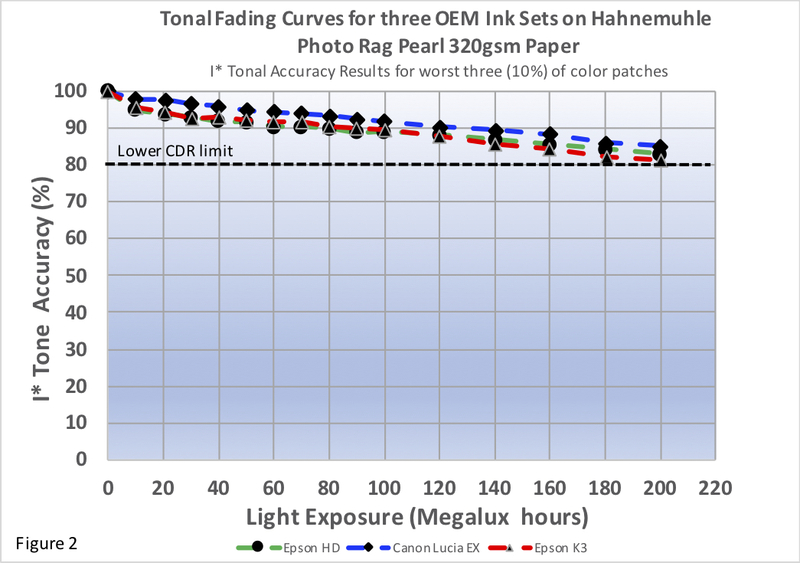 In fact, as the exposure increases from 100 to 200 Megalux hours the HD ink is actually fading at a higher rate than the K3 ink during this exposure interval. However, the fading signatures of the K3 and HD ink show notable differences on both media. Although the HD yellow ink has better fade resistance than the K3 yellow which definitely improves skin tone color stability, a greater shift towards bluish-gray hues in the neutral color patches can also be observed, particularly on the Hahnemühle Photo Rag Pearl media. This result is somewhat surprising. Bear in mind that the targets were printed using the full color mode of the printer drivers, so pigments other than the photo gray inks can be present in the neutral grayscale. To the extent that yellow is blended into the grayscale patches, one would have expected less blue color shift in the HD neutral scale compared to the K3, but if anything, the grayscale performance was worse for the samples printed with the HD ink set on both media. Figures 7 and 8 show the 30 color patches sorted in descending order from best to worst individual scores. 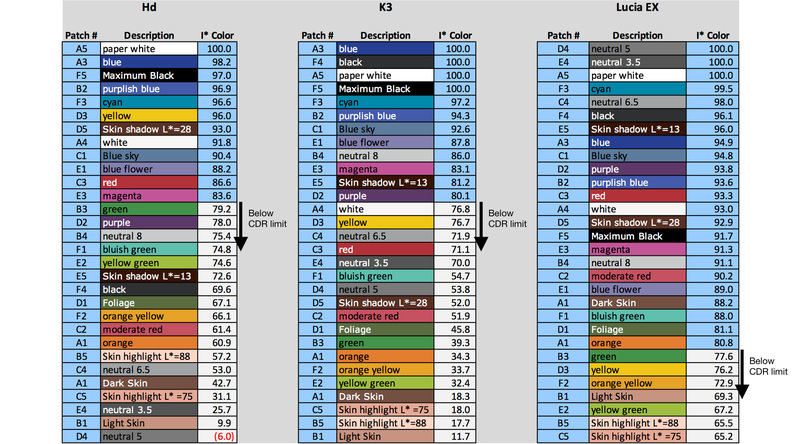 Note the rank order of the neutral patches compared to the skin tone values. The I* color and tone results shown in figures 1-6 can be visually confirmed by looking at the 200 Megalux hour fading patterns in the Aardenburg 30 color print targets digitally reproduced from their colorimetric measurements on pages 9 and 10 of the pdf version of this article. Take note of the gray scale row “before and after” results for both the K3 and HD ink sets as well as the skin tone color patches. The Epson HD ink set almost achieves Epson’s “2x-better-than-K3” fade resistance claim in the early stages of fading where the observer is not likely to notice much change in print quality (see the CDR scores on page 1 in the pdf version of this article). This result is good news. However, HD also has a decidedly more complex fading signature compared to the older K3 ink set. 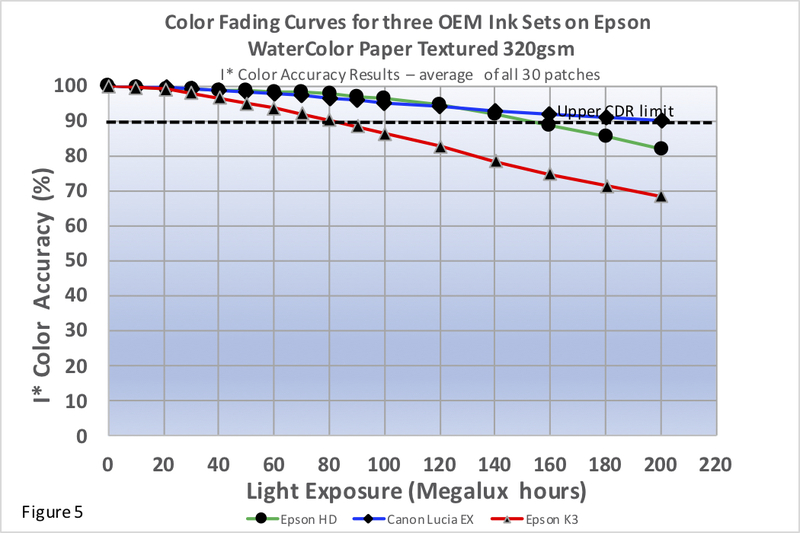 Its bifurcated fading curve that began to emerge at approximately 90 Megalux hours of light exposure and resulted in a 4-5x increase in rate of fade as the fading progressed into “easily noticeable” territory leaves Epson with considerable room for improvement in future aqueous pigmented ink formulations. The older Canon Lucia EX ink set exhibited a much more linear response over the 200 Megalux testing cycle which is why it achieved the best overall fade resistance on both media. The HD ink set’s bifurcated curve shape suggests that Epson chemists most likely altered the polymer encapsulation chemistry to retard the photo oxidation of the pigments rather than actually substituting the pigments (especially the yellow pigment) for inherently more stable ones. As the encapsulation loses its protective properties, the encapsulated pigments appear to be reverting to weaker inherent fade resistance. I* color values in descending order from Highest to Lowest values. The two media coating formulations were representative of many popular inkjet media, one having a fine art matte finish ink receptor coating, the other having a non RC “traditional fiber” glossy/luster ink receptor coating. The fact that each ink set produced a similar overall “fading signature” on both media suggests that the fading curves of all three ink sets were largely influenced by the ink chemistry formulations and not as a result of serious interactions with the paper coating chemistry. Neither paper contained OBAs, and media whitepoint color was stable throughout the test cycle. Hence, the measured color shifts were essentially the result of the ink performance on these media and not influenced by changes in media whitepoint color properties. In addition to the Epson HD ink non linear curve response, the HD ink set’s poorer grayscale light fastness (i.e., neutral patches turned more bluish-gray) compared to the older K3 ink set was an unexpected result. Whether the poorer HD grayscale performance was caused by increased blending of other colorants besides the photo gray inks in the Epson SC P600 printer driver, or whether changes to the HD photo gray ink chemistry are also involved cannot be determined from this study. Additionally, the SC P600 undoubtedly lays down a finer drop-size and with different screening and blending algorithms than the older Epson Pro Stylus 3880 used to prepare the K3 samples. It may be a contributing factor in the unexpected HD grayscale performance. The P600 printer driver screening and drop-size pattern is also likely to be different than larger Epson wide-format printer models like the SureColor P6000 and P8000. Therefore, these results should not be extrapolated to other Epson models using HD inks nor models that use the Epson HDX ink set. Further research is required when considering B&W printing performance using the new HD ink set. Such a study should compare different Epson printer models and OEM printer driver modes including Epson’s “Advanced B&W” mode where the results may be decidedly different. Hopefully, Aardenburg Imaging & Archives can undertake such a B&W printing study comparing K3 and HD ink sets in the near future.